Best thing to happen to travel since the Wright Bros. Swear by it. A unique way to fund travel dreams among friends and family. It creates community around travel. myTab.co is a travel gift card where you save cash & shout 'put it on myTab' so friends & family contribute to your dream trip. Then redeem the funds on myTab. We also broker exclusive rates with suppliers for myTabbers. We call this Match myCash and we take crowd funding to a whole new level & stabilize the economy for low time/long lead revenues. The more you save and fundraise cash for travels, we can negotiate exclusive deals. We’re taking crowd funding to a whole new level! 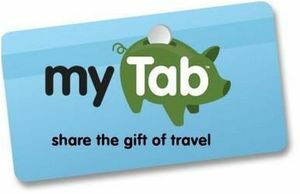 myTab.co (www.mytab.travel) is a travel gift card where you save travel cash and shout 'put it on myTab' so friends and family contribute towards your dream trip. Then simply redeem the funds from thousands of flights and hotels, all within myTab. myTabbers have a happier pre booking experience because they are cash rich so the focus shifts from price frustration to an exciting funding & booking momentum. Gifters know their cash gifting won't be discarded and they're emotionally involved in the full life cycle (note $30b of $100b gift cards a year are discarded, until we came along). myTab's available in the USA, UK and Australia. 20 years PR & Marketing experience in travel, tourism, hospitality, and entertainment. Level 4 Krav Maga and lacking a filter. With our "Match myCash" feature, we're an ally to the travel industry as we match user's saved/gifted cash & trips to suppliers/OTA's deals. This ensures the user doesn't lift a finger to search travel deals & the industry can accomodate their slow margins towards more strategic profit.